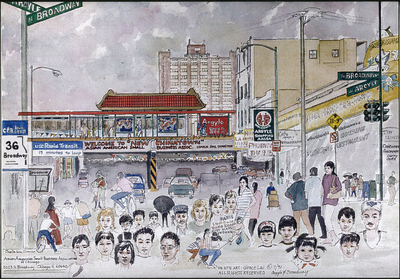 "Argyle & Broadway" (scan of a printed reproduction of an original watercolor and ink drawing), 1991. Original size unknown. In the lower left hand corner it says "Charlie Soo, Director, Asian American Small Business Association of Chicago 5023 N. Broadway, Chicago, IL 60640". Notice that in all of her drawings you will see her sketching onsite. In this picture she is in the center towards the bottom wearing a striped shirt.